Description: Our brand new steel bed with built-in ladder is an ideal space saving bed for your child's room. Elegance and function combined gives this contemporary bed a striking appearance. The design gives a stylish modern look crafted with durable steel framing. Designed with safety in mind, the bed includes full length guardrails and two sturdy integrated ladder. This bed is ideal for space-saving needs and accommodates a variety of options below the loft. It is the perfect addition for child's bedroom. Please refer to the picture to more size information. 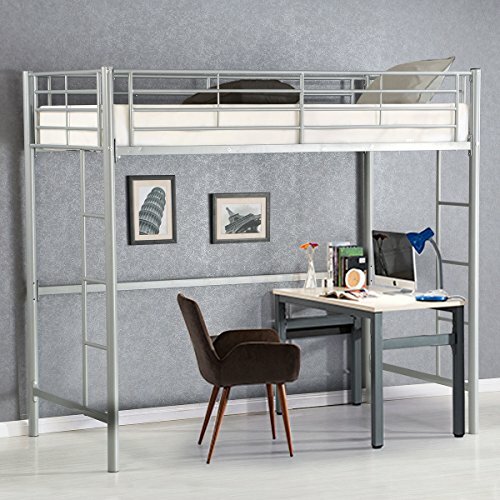 Costzon stainless steel loft bed frame, accommodates a variety of options below loft, ideal for space saving needs. This modern, stylish loft bed features a twin top and looks great in any bedroom or guest room arrangement. Two integrated side ladders come included to provide versatility and metal slats on the top bed offers the right amount of support, comfort, and security. Besides the sleek, space-saving design, it's also amazingly simple to assemble. Sturdy, Steel construction supports 300 lbs. Does NOT include mattresses or bedding.